There were very few persons who knew Sathya Sai Baba since he began his so-called ‘mission’ to save humanity who dared so much as to question anything he said. One of those was V. K. Narasimhan, the once world famous editor of the Indian Express group of newspapers, who defied Indira and Sanjay Gandhi over publishing facts about the 1973 Emergency under the threat of tanks! However, VKN was privately often most critical of Sai Baba, but he was also able to confront him to his face over some of his self-contradictions and faux-pas. These he knew well since he had to edit out many such from Sai Baba’s ‘discourses’, which he translated for the monthly journal ‘Sanathana Sarathi’. 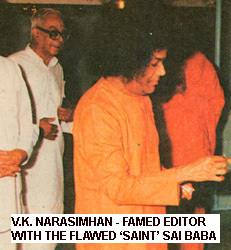 He told me he was worried that he would fall into disrepute because of the editing he had done on the original texts – for VKN hoped and largely believed that Sathya Sai was an important figure in the reformation of corrupt and calamitous India. Now we know that Sathya Sai Baba reflected many of the faults and ignorance of his own village environment, not least as to sexuality (which he denied he had any part in, but which has been testified by over 25 foreign male victims of his advances, though very few Indians have been able so far to come out and tell their stories, not least because of the murder of four young men in his bedroom in 1993).Read here about V.K. Narasimhan’s criticism of Sathya Sai Baba’s advaita preachings and how he changed tack because of these criticisms. This entry was posted on March 30, 2008 at 7:37 pm	and is filed under Cults, Gurus, Sathya Sai Baba, Vedanta. Tagged: Sanjay Gandhi, V .K. Narasimhan. You can follow any responses to this entry through the RSS 2.0 feed. You can leave a response, or trackback from your own site.